Water. It’s arguably the hardest part of taking care of a plant—we either forget to do it, or we drown our plant in our eagerness. Today, we’ve got the why, how, when, and how much of plant watering so you’ll be able to raise a happy and thriving plant with no trouble at all. When it comes to our gardens, you don’t have to guess about what, why, & how to water your plant. We believe in the joy of growing, so we’re trying to make gardening as easy as possible. However, we can’t put a lock on everything. We help control as much as we can, but there are two extremely important variables we simply can’t nail down to the details: sunlight and water. These two things are absolutely imperative for a plant’s well-being and for a successful harvest. Unfortunately, they’re also the hardest things to understand. We provided the sunlight know-how a couple months ago, but now we’re back to address the water dilemma. What are the rules of watering? How do you know how much is enough, but not too much? And how do you even know if your plant is happy? We’ve addressed it all and more in this post, so you can hone your gardening skills and ensure a happy, healthy plant and an easeful gardening experience. First, why do plants need water and what do they do with it? Water helps a plant survive in two different ways. First, it essentially is the plant. Adult humans are about 60% water, which seems like a staggeringly high percentage. But here’s the thing—plants are actually 90% water. There’s a thing called turgor. It’s the water pressure inside plants’ cells, and it truthfully is the plant. So, when a plant has enough water, the pressure is such that it can support its own structure. Secondly, (and you know this from middle school), water is a necessary component of photosynthesis. In other words, plants need water to create their food. Then, when the chemical reaction has completed and the plant is in sun, the leaves open up their pores and exchanges the water for carbon dioxide in a process called transpiration. During transpiration, plants give off a lot of water—nearly their body weight in water. This means plants are thirsty, and they’re thirsty often. So watering your garden is an extremely important part of keeping your plants happy and thriving. Okay, but how much water do I give my plants? Right. This is the tricky part. And truthfully, there’s no one-size-fits-all answer here. How much and how often you water a plant depends on all sorts of things, like age, conditions, growth cycles, seasonal changes, light intensity, light duration, temperature (indoor/outdoor both apply), soil, the type of container, relative humidity, and existing moisture levels. Basically, there are four different kinds of plants—or rather, there are four groups of watering needs. Plants that like the soil to completely dry out between waterings. These are plants like cacti, aloe, and succulents. Plants that tolerate some dryness between waterings, but not for long. Tomato plants, herbs, and flowering bulbs all fall into this group. Plants that like even, consistent moisture, but not too much water. African violets are the poster child for this grouping. We gave you some good guidelines when we gave you your plant, so, first, follow that information. If you’re not shopping with us, thank the heavens for the internet and do your research! Get online, read the plant tags, and find out where and how your plant natively lives. Then, pay attention. The key to raising a happy plant is to just notice! We all love a daily routine that doesn’t vary, but that’s simply not plausible when you’re growing. We suggest doing routine checkups. These are best when they happen in the morning (or early evening, if you must). When you do these, look for signs of trouble. This could include insects, wilts, spots, fungus, and general signs of over or underwatering—we’ll go through these signs later. Also, note new growth, sprouting, flowers, or fruits! This routine checkup time is a good time to rotate the container a little every day. This will prevent any heavy leaning or stretching towards light—especially if you have a large structure (like a house) that blocks the sun daily. And right, we know. None of this tells you how much water. We can’t tell you specifics, but when it comes to watering, we do have some very general rules for you. When you purchased your plant, we told you what kind of watering your plant likes, so this is what you’re aiming for! In any case, this is the kind of information that’s really easy to find online. And quick reminder! Plants usually need less water than people expect. People kill their plants more often by overwatering them than by underwatering them. 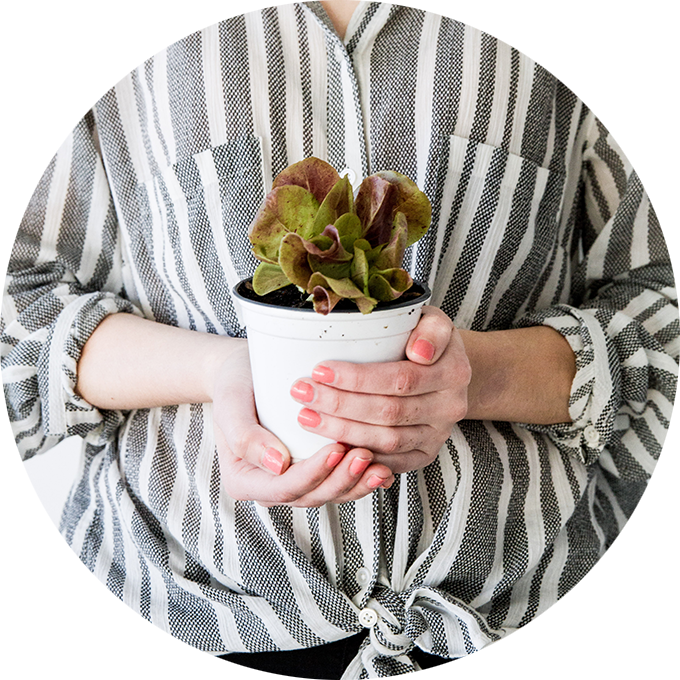 The good news is that your plant wants to live—it’s going to do its best to survive and thrive. So think of your plant’s struggle as feedback and some wiggle room to figure out how much water it likes best. What should a watering look like? First, figure out whether your plants need water. There are two methods for testing moisture levels in the soil. Option A is purchasing a moisture meter. They’re relatively inexpensive and easy to use. You insert the probes into the soil at the root level, and the dial on the meter will tell you how much moisture is in the plant on a scale from 1-10. Whether you water right then depends on the type of plant you have. OR you can use our trusted fingertip method. Take your finger and press it in deep into the soil near the roots. What you can see on top of the soil might look damp, but if the soil underneath feels dry, it’s might be time to water. If you’ve decided to water that day, follow these ten basic rules. EVENLY MOIST. Most plants prefer and depend on even moisture, consistently. Sometimes, if you dry out your plant slightly before watering, root growth will abound—but this depends on the desires of your plant. WATER DEEPLY. You should have drainage before you stop watering. Remove the excess water after letting it sit for 15 minutes. This deep watering is much more effective than sprinkling a little water on the topsoil frequently. NOT TOO QUICKLY. Or too heavily at once. Pour consistently and slowly. Otherwise, the water will just run down the outside of the root ball and leave the plant dry. If you do this, you’ll still get drainage, but your plant won’t get any water! If you’re unsure, just check near the root with your finger. DON’T LET IT SIT. Drain, drain, drain. After 15 minutes, you must remove the drainage tray. Otherwise, your plant will continue to soak up that water, and you’ll simply be overwatering your plant. GIVE ENOUGH, BUT DON’T WATERLOG. Obviously. Plants don’t know when they’ve had enough water, so they’ll just keep on drinking. This means the roots become deluged, and they can’t get enough oxygen. However, make sure that the water reaches the roots. If only the upper soil is moistened, it’s doing no good to your plant. DON’T WATER THE LEAVES. Getting foliage wet just spreads diseases and attracts insects. Water the soil so the roots get the water they need. If you’re trying to clean the leaves, just use a paper towel. WATER IN THE MORNING. If you must, you can water early evening, but not at night. Letting your plants sit in their water all night is a good way to develop diseases and insects. Unless your plant has wilted, it’ll last until morning—water it then. WATCH THE WEATHER. If you have outdoor plants, the weather is a super relevant part of your watering routine, even if the rain can’t reach them directly. If you’re experiencing tons of rainstorms, your plant is too! Likely, you’ll need to water less. If you’re experiencing extremely hot and dry weather, so is your plant. It’ll probably need more water. NOTE YOUR LIGHT. If your plant gets a lot of natural light every day, it might need less water than a plant that doesn’t. Just pay attention to how your plant reacting to its circumstances. QUALITY OF THE WATER. Ideally, you use rainwater to water your plants. If you have a rain barrel, great. Most people don’t, and that’s okay too. You can use tap water, but it’s best to let it sit for about 24 hours. This will let any chlorine gas evaporate off the top, and the temperature of the water will settle to room temperature—you don’t want to shock your plant with extremely cold or hot water. How do I know if I’ve underwatered/overwatered? If your plant is dehydrated, you’ll see yellowing and dried leaves towards the bottom of the plant. The leaves go first, so even though the roots and stalk look green, it’s struggling! You may also be able to see the roots at the surface of the dirt, and the ground around the plant will crack. If you’ve overwatered, your plant will be wet and wilting. If your plant is green but wilting, you may be at the beginning stages of overwatering. Then, you’ll see yellow, falling leaves. If you also have new growth falling from your plant, it’s definitely overwatered. You might also see brown leaves. This could potentially be because of some other reason than overwatering, but the answer is not to immediately pour water on them. Check the soil. Overwatering causes something called edema. This is when the plant’s cells expand to try and hold all the water and sometimes rupture. You can see these burst cells as blisters or lesions on the plant—they’ll eventually turn into dark or white scar tissue. Sometimes, indentations on the leaves show up as a symptom of edema. Similarly, you might get root rot. This is when the plant’s roots turn gray, brown, and slimy and cause the rest of the plant to wilt. If you see these symptoms, adjust accordingly! It’s all more simple than you think. If you’re paying attention to your plant, and you truly care whether it lives, you’ll be in good shape. You and your plant are on the same team—it also wants to survive. Together, you’ll be able to find a happy watering solution that will produce a thriving and productive plant.